15 tins contain all the seasonings you need to make 5 fab pizzas and flatbreads from around the world. If "pizza" to you inevitably means a cheese-studded tomato-y triangle, it's time to get on your magic pizza carpet and fly around the world with Julie Pedersen's globally inspired seasoning kit. 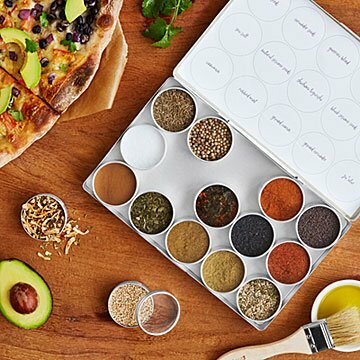 The 15 tins contain all the spices, herbs, and blends you need to make five knockout pizzas and flatbreads, including Japanese Okonomiyaki pizza, Lebanese Falafel pizza, or Indian Chickpea pizza with Lime Raita (recipes included). An inspired gift for pizza lovers, foodies, and entertainers who like experimenting in the kitchen. Assembled in Canada. Looking for more globally-inspired dinners? Try our Global Chili & Stew and Global Taco seasoning kits! Yes I will buy this again. Nice size tins, full of wonderful smelling spices! Nice variety of spices. I didn't notice any markings on the spice tins themselves, so must be careful not to mix them up if unfamiliar with spices, but this is a wonderful gift for people who love to cook.